Father-of-four, Andrew Brown, has shared a heartbreaking photo of his little girl Hayley, seven, who is currently fighting cancer. 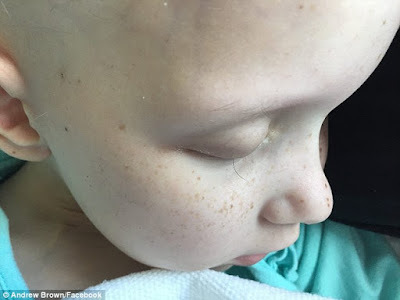 The moving photograph shows just one single eyelash remaining on Hayley's eye after months of chemotherapy. 'That one last eyelash has been hanging on, on it's own, for a few weeks now,' Mr Brown, a Melbourne-based comedian, captioned the photo. Hayley was diagnosed in June after doctors discovered a five centimetre tumour growing inside her nose. As a result, she was told she would need to undergo eight months of chemotherapy and radiotherapy to fight it. To help Mr Brown, his wife, Leia Brown and Hayley, their friend Andrea Huggins has put together a MyCause page to raise funds. Chemo is a industry for profit not help and most doctors push for it like con artist with no remorse. Chemo is a killer not a treatment, plant based diet and other natural treatments can and will cure/prevent cancer. Did you know that Chemo Treatment has killed more people than actually saved from Cancer? It's just sad because #CANNABIS could have saved her from the poison to begin wit. In sorry your parents put you thru chemo(proven ineffective) my heart goes out to this girl. Little girl, you don't have cancer. Cancer has you. You fight, fight, fight! Nothing good about this post and the chemo. Cannabis enough said. Chemo as a cure is disheartening. Poison doesn't get better with poison. I sincerely hope she beat cancer and is living a happy life now. I don't have a father because of chemotherapy and I simply don't know how to get through life without him. Chemo has 2.3% success rate from 2000 to 2015 and they are still forcing cancer patients for chemo...how can you recommend a treatment that has almost 98% failure chances..simply just doesn't make sense. End the long suffering and all the disease that plague the earth. She is still very beautiful. I pray for U, ALLAH bless U. dear. Love to all cancer patients..u r the bravest!!! Lots of love and hugs to you from here dear. Not beautiful but only heart breaking.